Howdy, folks! I'm Scott C Adams, artist and toy geek with another overblown website (see MegoMuseum.com) about toys I like. Welcome! I have been obsessed with collecting Sesame Street Finger Puppets for several years now and this site is the fruit of that obsession. 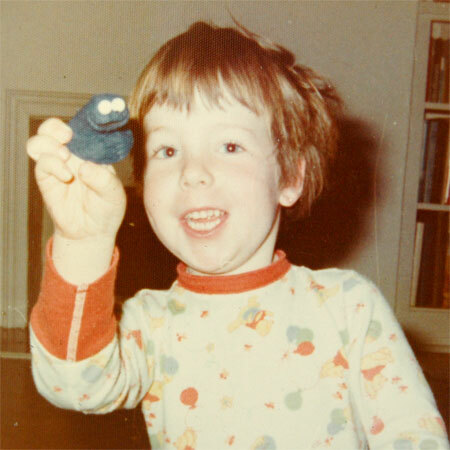 I got my first SSFP for Christmas 1972 (yep, that's me to the left in the Pooh jammies), a Topper Cookie Monster and soon had the whole set. I carried them with me everywhere. A whole TV show in your coat pocket, you can't go wrong. A few things about this website. First, World's Greatest Sesame Street Finger Puppets is my own name for this line of toys. I am originally a Mego collector, and Mego collectors use the phrase World's Greatest (Super Heroes, Super Knights, Super Pirates, pants, bicycle, coffee mug, what have you) for everything. Rightfully, these could be called Child Guidance Sesame Street Finger Puppets as CG was the main producer of them, but as you will see, the original maker was Topper/Educational Toys and it is they who truly made the best Sesame Street finger puppets. So, WGSSFPs it is! This is a VERY narrowly defined site. Sesame Street was a merchandising juggernaut from the very start and there are tons of great toys from the 1970s that deserve a thorough archive, including the famous hand puppets that accompanied this line. But I set out to collect these because it was a finite line, it had limits. I don't collect any other Sesame Street stuff. I have a few pieces here and there but I quickly put an end to it. The hand puppets, the miniatures, the puzzles, games, cookie jars. No. Not in my house. I have enough stuff that nobody cares about but me. As you can tell by the site, though, there's more than enough to keep me busy. There are many discoveries yet to be made and more than a few impossible holy grails to find. Yet they don't take up a lot of space and are generally pretty affordable. Anyway. I think I've made the point that I'm insane and unbalanced. Welcome. Happy collecting! Extra Special Thanks goes to Brian Heiler, of Plaidstallions and MegoMuseum fame. Brian hooked me up with a lot of the catalogs and magazine materials to put this site together. 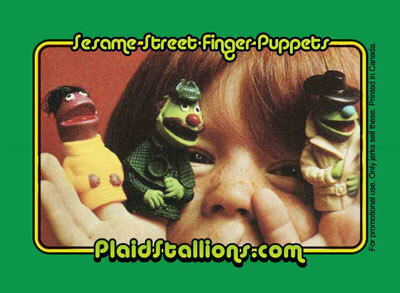 Together we came up with the latest WGSSFP collectible, the PlaidStallions Sesame Street Finger Puppets card!